My favorite all-purpose cleaner is vinegar. It breaks down mold, grease, mineral deposits, and it’s anti-bacterial. (Don’t use it on granite, tile, or marble though.) Unfortunately, Hubby thinks it makes the house smell like a salad. What’s a girl to do? Citrus peels to the rescue! Since they don’t break down easily in the compost bin, I had been throwing them away (with all the associated guilt that entails). After a bit of research, I learned that citrus peels contain a natural oil called D-limonene. It’s a great degreaser, stain remover, and it smells good too. Now, after peeling any citrus fruit (oranges, lemons, limes, grapefruit) I put the peels in a large jar of white vinegar. The peels steep for a week or two, and I strain them out when adding vinegar to my homemade cleaners. How do you avoid the tongue-twister chemicals in commercial cleaners? This post was shared onWildcrafting Wednesday and Simple Lives Thursday. Thanks for the citrus tip! I’ve been using vinegar for a couple months now. I love that its natural and don’t have to worry about any chimicals getting into our meals just from touching the counter top. My only beef with it is that is didn’t cut grease very well. I”ll try this and hope it helps! Thanks so much! Following you via-email. I’ve used vinegar for ever, best thing you can use on windows. I like the idea of adding the citrus, thanks! HI, I am stopping by from The Homespun Life. I just recently began making my own cleaner and I have had the salad complaints, too. About 2 weeks ago the orange trees delivered a nice crop and rather than throw the peels out I put them in a large pickle jar and covered it in white vinegar. I was hoping it would help change the odor, so I am glad to find I did the right thing. Thanks for sharing. 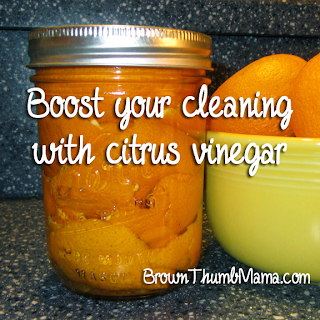 Cleaning with Citrus vinegar adds the power of citrus oil to your cleanser. It also removes the smell so instead of using vinegar you can clean it. And also those homemade cleaning products are good for cleaning. If you run out of lemons, or simply would enjoy another option (sans the enzymes, unfortunately), this Herbal Vinegar Cleaner doesn’t smell like a salad. 😉 Or, maybe the two could be combined…. Sorry, I obviously forgot to provide the link…. I love this recipe. How long is the mixture good for? There’s not much left after granite, marble or tile, especially with overspray. I guess stainless, aluminum, fiberglass and formica.